Today I went up to Leopardstown Racecourse to see the IVVMCC Annual Classic Motorcycle Show. There was quite a big crowd there with of course a lot of bikers attending. There were also some families with small children. But what a disappointment the Show was! For a start, there were not many vintage bikes on show. There were plenty of stalls selling all kinds of parts and bits n' bobs for bikes. A more accurate title for the event might have been the "Annual Bike Bits in a Box Jumble Sale". None of the old parts interested me - mostly because I didn't know what this bar, or that pipe, or the other lump of iron was for. Of courses there were enthusiasts there who were drooling over all the bits, but sadly - not me. There were a few old bikes - but I'd say no more than 20 in total. There was even a guy selling country and western CDs! 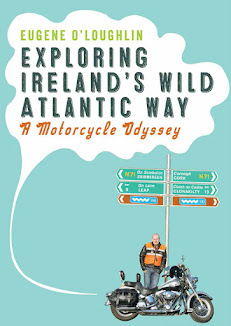 I was tempted to enter a draw for a Harley-Davidson Sportster - but tickets at €50 each was a bit rich for me. 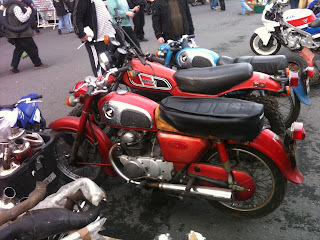 The most interesting items by far for me were two Honda CD175s, one red and one blue, for sale at one of the stalls. 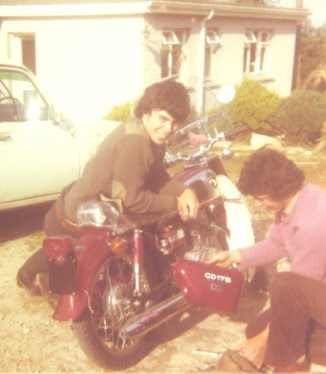 I took a photo - the red one is just like the same bike my brother Joe and I had back in the late 1970s (see photo to left! - that's me leaning on the bike!). So this was quite a nostalgic moment for me - our red CD175 was stolen from Trinity College on 8th December 1981. The bike above brought back some memories. I asked about it and the guys on the stand think it was a 1978 model - they wanted €400 for it. It is not working and would take quite a bit of rebuild and repair to get it going. As someone who has almost no mechanical knowledge, I thought about buying it for about 2 seconds and decided not to. As you can see it is in pretty poor shape, even though it is 33 years old.